Captain Toad is a delightful puzzle game that will leave parents and kids alike excited for more adventures and treasure hunts. Captain Toad: Treasure Tracker is another game that comes by way of the Wii U, with a number of subtle updates and changes that take advantage of the Switch’s touchscreen in handheld mode. In Episode 1, you play as Captain Toad as he works toward rescuing Toadette from an evil bird that stole their first star and kidnapped Toadette. Toad has to use his environment to get through a level without succumbing to the dangers within it (because he can’t move quickly, nor can he jump). Captain Toad: Treasure Tracker is a puzzle game that lets players use spatial learning and awareness to manipulate the landscape, gather coins, collect diamonds, defeat (or avoid) enemies like Shy Guy, and collect the star. If you or your kiddo have played either of the Monument Valley games, you’ll find a number of similarities in how the game mechanics unfold. Unlike many puzzle games, like Burnstar, where the difficulty ramps up quickly, Captain Toad eases the player in, providing the odd “easy win” and ensuring that a level can take the “critical path” to the star, without needing to get diamonds along the way. There are enough levels (and challenge in those levels) that replaying doesn’t feel tired or stale, even when you play together. You can turn on “2 player” mode so that one person controls Captain Toad (or Toadette, in later levels) and the other controls the pointer (for poking at blocks and revealing hidden coins) and the camera. It requires quite a bit of coordination, but when it works, it really works. Can kids play on their own? Yes, absolutely. Even younger kids can enjoy Captain Toad sitting next to you on the couch, rather than you intervening and solving puzzles for them. It engages their spatial learning and forces them to look at the game environment from a number of different angles in order to find a path through hazards, enemies, and tricky terrain. There’s very little in terms of reading, so kids of all ages should be able to pick up and play in docked mode easily. It’s a relatively low stakes game in that even if you lose all of your lives (because there are some tricky levels that require quite a bit of fine motor control), the effect is minimal. The diamonds are persistent between lives until you reach zero, so that’s the only drawback. You get to keep your level unlocks, thankfully. Is it better to play solo or co-op? Captain Toad is best played in solo mode. The co-op (2 player) mode is novel, but it doesn’t give either player much in the way of meaningful decisions with the Joy-Con they’re using. It’s fun to play with others in the room, of course. Solving puzzles together means that you have more than one set of eyeballs on a level, giving you a better chance of seeing hidden secrets (like golden mushrooms or one of Captain Toad’s friends) and picking safe paths through challenging environments. The best thing to do when playing Captain Toad with friends and family in the room is to pass the Joy-Con back and forth, instead of playing 2 player. It allows the player to maintain full control and still accept feedback from the others in the room. What’s the best part of the game? The puzzles that each of the levels lay out are so much fun. They’re just challenging enough to create a sense of urgency (especially when you encounter the bosses), but they’re not so challenging that they endlessly frustrate when you need to go through a level again. The additional little bits -- like using an Amiibo for power-ups in a given level, playing hide and seek with a mini pixelated Toad when you finish the level, and the bonus coin levels -- give the game a ton of personality. For me, the best part of the game was passing the controller back and forth with my loved ones and solving puzzles together. Collaboration is key, especially when the difficulty gets a bit much in the later levels, so moving through levels together was great fun. Do you recommend purchasing it for Switch or playing it on Wii U (or 3DS)? This is a definitely recommend for the Switch. It’s a great game on the 3DS, but if you want a high-def experience with a touch screen that feels fantastic to use, then get it on the Switch. The Wii U version is pretty good, but the quality of life updates (including gorgeous graphics) makes it well worth the (re)play on Switch. 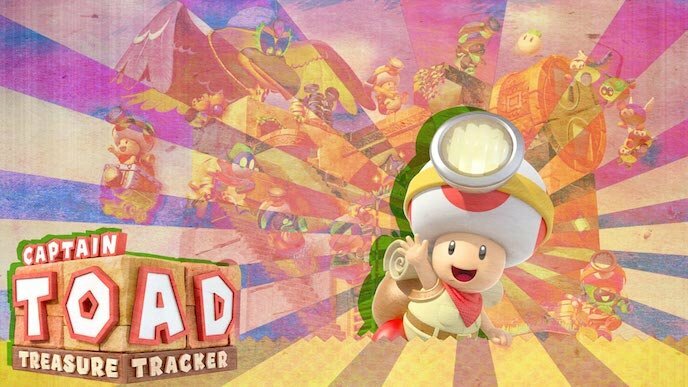 Captain Toad: Treasure Tracker feels good all the way through, both solo or collaborative with family and friends. If you’ve been looking for a friendly puzzle game like mobile-hit Monument Valley (and its sequel), Captain Toad’s got you covered. Don’t miss out on his adorable adventures and treasure hunting. It’s well worth it. It’s a treasure all by itself.